You know icy surfaces can create hazardous conditions throughout the property, but did you know applying the wrong ice melting product like salt can cause damage to concrete surfaces? Many property owners have been concerned about the use of salt on concrete surfaces, such as driveways, walkways, and sidewalks. In fact, salt is the number one enemy of concrete. 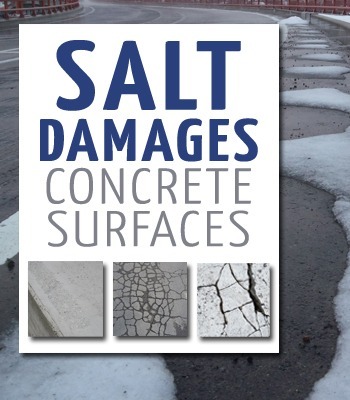 So how does salt damage concrete, and what are some of the best alternatives to protecting your pavement? In order to understand the effects of salt, you must first know the basics of concrete composition. Concrete is porous, attracting and absorbing 10% of water. When water freezes in the concrete, the pressure of the frozen water increases. As a result, pits, cracks, flakes, and potholes, as well as scaling form on the surface. Salt is an acid that lowers the pH balance of the concrete. Because it is acidic, it weakens the strength of the concrete and increases the size of the pores. These characteristics allow water and other chemicals to penetrate the surface. If you have patio furniture, salt can also corrode the metal frames. Fortunately, there are more eco-friendly alternatives to using salt if you are trying to preserve the lifespan of your concrete. Cat litter doesn’t melt ice and snow, but it provides traction to prevent slippery surfaces. Most litter is made of clay and will dissolve, without damaging grass, concrete, or other surfaces. Wood chips, sand, and gravel provide traction to icy concrete surfaces. These are natural materials, so it won’t matter if they are left behind after the snow and ice melts. Because beet juice is effective in temperatures below 20 degrees, it is used to melt ice on municipal roads and driveways. It can also be used for sidewalks, patios, and walkways. Beet juice is biodegradable. If you have concrete steps or stairs, heated stair mats can be placed on your steps. They can melt current ice and prevent new ice and snow from building up on the steps. Safe Paw® is a safe ice melting product that can be used around pets and children. Also, it will not damage concrete surfaces and is made of natural materials. Using salt on a daily basis can damage your concrete, leading to cracks and sinking. If you need to contact a concrete repair specialist, call Polyjacking.com. We are specialists in lifting and leveling damaged concrete throughout the Kansas City and St. Louis areas. While a fresh, white blanket of snow is a pleasant sight, the inevitable task of removing it can be damaging. If not done properly, you can damage your driveway, sidewalk, or parking lot. To prevent costly repairs, keep an eye on your asphalt pavement as winter approaches. Look for scrapes, cracks, and potholes across the surface. These conditions can be unsafe for residents, pedestrians, students, and vehicles. Be prepared this winter by making the necessary repairs to minimize asphalt damage on and around your property. Snow Plows – Snow plows scrape the pavement, causing damage to the pavement. 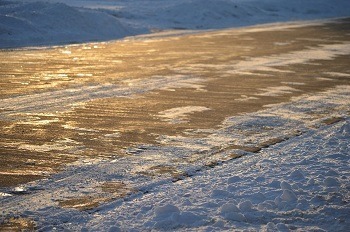 If you notice scrapes in your pavement once the snow melts, contact Polyjacking.com to seal coat the pavement. 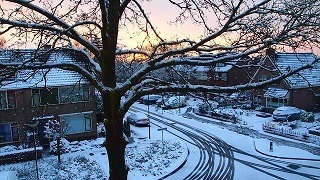 Melting Snow – One of the advantages of asphalt pavements is that they absorb heat and melt the snow. The downside is that this can lead to rapid water runoff, creating flooding and pooling water. Over time, this can cause cracks across the surface. Freezing and Thawing – Because the temperature fluctuates throughout the winter months, cracks develop in asphalt pavement. They get bigger and spread as the ground goes through freezing and thawing cycles, causing voids underneath the surface. 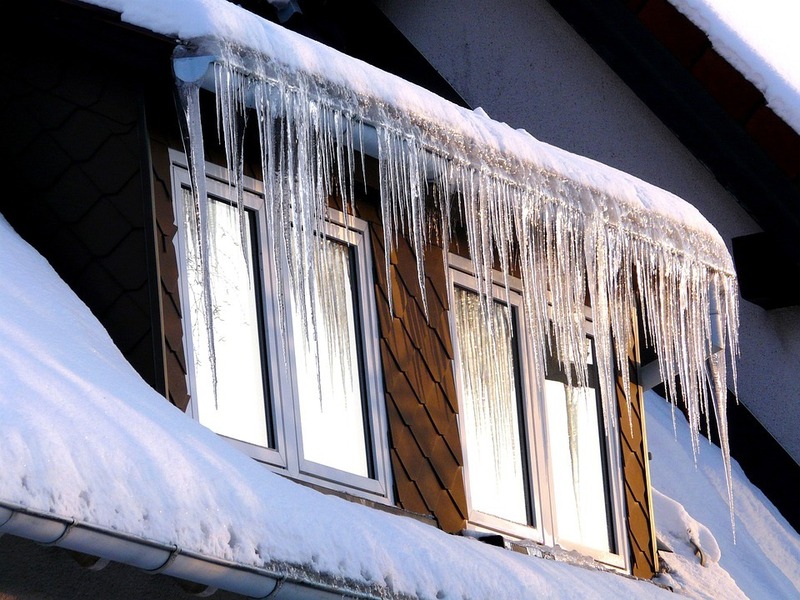 With proper maintenance, you can prevent damage from these freezing and thawing cycles. Deicers – Salt, potassium acetate, and other deicing agents should be used sparingly due to an increased risk of damage to asphalt surfaces. They are dangerous to the environment surrounding the paved areas, including vegetation, pets, runoff water, and flooring in your home. It’s important to use deicing mixes that are environmentally friendly. To prepare for winter, seal any cracks and holes that are less than a half inch. This will prevent runoff and smooth the surface. Larger holes need to be filled with gravel, then sealed. Polyjacking.com can always help when repairing or preparing your asphalt. We offer professional and efficient concrete repair services to keep your maintenance budget down and minimize asphalt damage. For sunken asphalt, we can lift and level the surface back to normal by injecting a polyurethane foam underneath the surface. As the polyurethane foam expands, it fills voids and lifts the surface to the desired height. Because polyurethane stabilizes loose soils, it prevents future settlement and cracking. We’ll restore your sinking asphalt back to normal. If you have any questions about polyjacking or concrete resurfacing, contact Polyjacking.com today. The winter months have set in and there is a lot of frozen precipitation in the St. Louis and Kansas City area. Ice and snow can damage the concrete around your home or business. As it gets into the pores of the slab, it can cause the concrete to heave. Also, the effects of the freeze-thaw cycles can cause scaling, cracking, and crumbling of the concrete. Deicing chemicals that are used on concrete throughout the winter also cause damage to concrete. These chemicals cause loss of surface mortar on the concrete. When this happens, it is called scaling. Signs of scaling are easy to see as the concrete will become rough, flaky, and may pit. The winter months will also cause the concrete to crack. This is the result of freeze-thaw deterioration of the aggregate within the concrete. Water then gets into the cracks and accumulates. Then, with the freeze-thaw cycles, the cracks will form. Concrete is a porous material that absorbs water and as the water freezes, it pushes the cement binder apart. 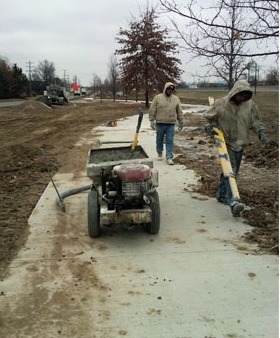 The winters in Kansas City and St. Louis can be extremely hard on the concrete around your home or business. Let Polyjacking.com, a division of Pro Foundation Technology, get your concrete back to its original level and repair any cracks that may have formed throughout the winter. If you find that your concrete has been damaged by the freeze/thaw cycles that occur throughout the winter, we use high-density polyurethane foam to lift and level your concrete. We use the right poly equipment for the installation process. This method is relatively simple. A small 5/8″ hole is drilled through the affected concrete. 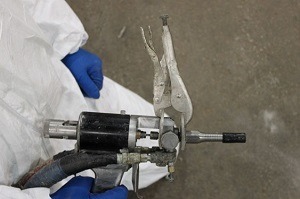 The polyurethane foam is injected into the voids beneath the concrete. Polyurethane foam expands to over 20 times its liquid volume to entirely fill the void. This will raise the concrete back to its original level. Polyurethane foam also compacts and strengthens the base soil. After the injection, the holes are filled and the site is cleaned up. Due to the short hardening time of the polyurethane, the concrete surface can be used about 15 minutes after the repair is completed. This polyurethane foam is impervious to water, preventing future erosion problems. Why choose Polyjacking.com for concrete repair? We take pride in the outstanding reputation we have established. We are committed to quality and we are long-standing members of the Home Builders Association and the Better Business Bureau. We will get your concrete back to its original level and prevent future soil erosion beneath the concrete. Residents in Kansas City, MO are used to snowy and icy winters. But what is different in the past few years is the extent and number of icy, snowy storms that this area has endured. These long, extended periods of ice and snow will affect your concrete and in the spring, you may see the damage that the harsh winter has caused. When water freezes, it expands, and, adding the constant freeze-thaw cycles with a lot of moisture, the potential for concrete damage increases. One of the effects that cause extreme weather conditions is D-cracking. D-cracks are closely spaced cracks along the joints of the concrete. If you find concrete damage in the spring after the extreme weather of the winter months, contact Polyjacking.com. We have the products and experience to get your concrete repaired in Kansas City, MO. After the snow clears and you find that the extreme weather has caused concrete damage, Polyjacking.com can help get it back to its original level and looking like new again. The cost-effective method that we use for foundation repair is injecting a polyurethane foam into the concrete to fill the voids and lift the concrete. Polyjacking is simple and less disruptive than replacing concrete. Polyurethane trucks and the right equipment are used for the installation process. A small hole is drilled into the affected concrete. Polyurethane foam is injected into the hole and it expands to 20 times its liquid volume to fill the voids beneath the concrete entirely. The fast curing time allows the concrete to be used about 15 minutes after the repair is done. The hole is filled and the site is cleaned up. Polyjacking.com has been in business since 1978 and is a member of the Home Builders Association and the Better Business Bureau. Contact us for a free quote on any of your concrete repair needs in Kansas City, MO or the surrounding areas today!